Michael Neuberger, Deputy Director of the LMB and Head of Division of Protein and Nucleic Acid Chemistry died on Saturday 26 October, after several months of serious illness. He was an outstanding and brilliant scientist. Michael was educated at Westminster School and Trinity College Cambridge, received a first class honours degree in Natural Sciences (Biochemistry), and started a PhD in Biochemistry with Brian Hartley at Imperial College in London in 1974. His interest in biochemistry followed in the tracks of his father, Albert Neuberger, who was a distinguished biochemist (and former PhD supervisor of Frederick Sanger). At Imperial College, Michael studied the experimental evolution of enzymes in Klebsiella aerogenes, using transducing phages to analyze gene duplications of the evolved enzymes. The work won him a Junior Research Fellowship at Trinity College in 1977, and after a year of postdoctoral work at Imperial College he applied to work at the LMB with Cesar Milstein. 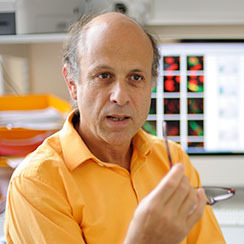 Cesar recommended that he first learn some immunology, and Michael went to work with Klaus Rajewsky in the University of Cologne on an EMBO Fellowship. Armed with a probe for the heavy chain variable region of a hapten-binding antibody, Michael returned to Cambridge and launched into a study of antibody genes and the DNA elements that control their expression. He soon identified the Ig heavy-chain (IgH) intron enhancer and then additional enhancers at the 3′-ends of the κ and IgH loci. His vectors facilitated the expression of a range of engineered antibodies, and in various collaborations he created and/or characterized some of the first engineered chimaeric and humanized antibodies. By the late 1980s he was working with transgenic mice, and again in various collaborations, he created mice that produced wholly human antibodies. His work had a huge impact on the development of therapeutic antibodies. By the age of 40 Michael had been elected a Fellow of the Royal Society. Like Cesar Milstein, Michael became intrigued by the mechanisms underlying the evolution of low affinity IgM antibodies of the primary immune response to the high affinity class-switched IgG, IgA and IgE antibodies needed to fight pathogens. At the turn of the century, Michael showed that an enzyme specific to B lymphocytes (AID, activation-induced deaminase) targets cytosine (C) bases within the antibody genes, deaminating them to yield uracil (U). The lesions generated in the DNA are then recognized by components of the DNA base excision and mismatch repair pathways, resulting in both antibody hypermutation and immunoglobulin class-switch recombination. This discovery, now in the textbooks, gave a deep insight into the molecular processes underlying immunity, and also appears relevant for the generation of mutations in cancer. Earlier this year Michael was elected as a foreign associate of the US National Academy of Sciences. Michael represented the best of the LMB. Not only a brilliant researcher but friendly, understated, interesting, informal and kind; he would agonize over difficult decisions concerning the fate of young scientists in his charge. His loss is a major blow to all that knew him, and to science in general.